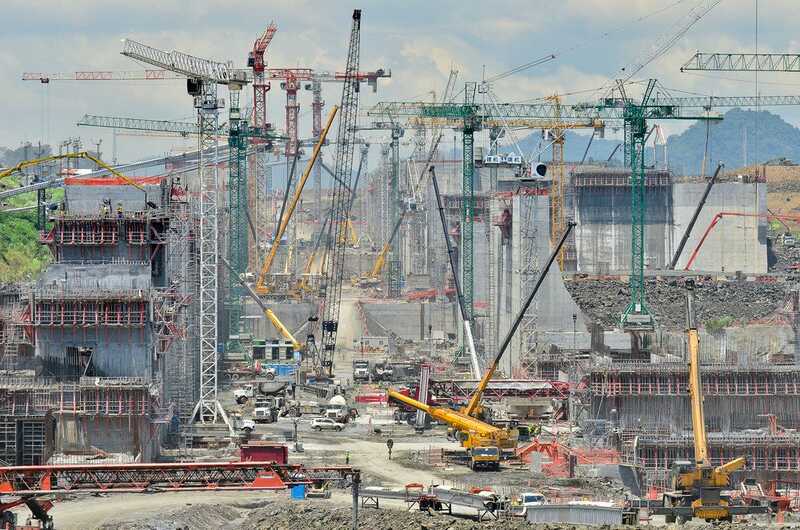 Panama CanalTwo massive iron gates being moved into position at the site of a new lock, part of a $5.25 billion expansion of the Panama Canal. On October 9, 1913, President Woodrow Wilson opened the Panama Canal by dynamiting the final dikes holding the water at bay. He did it from the comfort of the White House, keying a telegraph transmitter that set off the explosion from over 2,000 miles away. 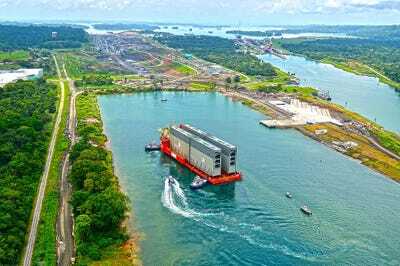 In the 103 years since Wilson pushed that button, the Panama Canal has become an international shipping bottleneck, as container ships grew too large for its ageing locks. Much of that will change this weekend, when a $5.25 billion effort to expand the canal reaches its long-delayed conclusion, allowing ships more than 2 1/2 times the size of the current limit to pass through the waterway. The increased capacity could have profound effects on the US transportation industry, as the cost of shipping from Asia to ports in the eastern US would drop significantly. Simply put, bigger ships are more economically efficient and have lower per-unit costs. Larger ships and lower costs meant importers traditionally chose to bring in goods from Asia at West Coast ports and then to the eastern US by rail. But if the canal’s increased capacity lowers shipping costs to the East Coast by enough, it could mean a sizable loss of freight volume over time for western American railroads, Nerijus Poskus, an expert on international shipping at the booking company Flexport, told Business Insider. If shippers chose to go through the canal, western railroads such as BNSF, best known as a subsidiary of Warren Buffett’s Berkshire Hathaway, and Union Pacific could suffer a drop in freight volume, while eastern railroads like Norfolk Southern, CN, and CSX could see an increase, Poskus said. 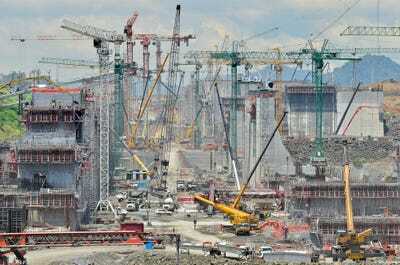 Panama CanalConstruction on one of the major locks underway in Panama. Louisville, Kentucky; Memphis, Tennessee; Nashville, Tennessee; and, most immediately, the Gulf Coast. Already, the shipping giants Maersk and MSC have announced a service to Mobile, Alabama, beginning early next month in anticipation of the canal expansion. Other companies are likely to follow suit. The ports at Los Angeles and at Long Beach, California, whose port is undergoing a $4.6 billion expansion, may see a drop-off in traffic. Union Pacific, the largest American railroad by freight volume, operates exclusively in the western half of the US. During the company’s first-quarter earnings call last month, executives dismissed the potential effects of the expanded canal. Some industry watchers are also unconvinced that the expanded canal can change the game. “Even bigger ships are going to be going to the West Coast than are going to be going through the Panama Canal,” David Vernon, a transportation analyst at Bernstein, told Business Insider. 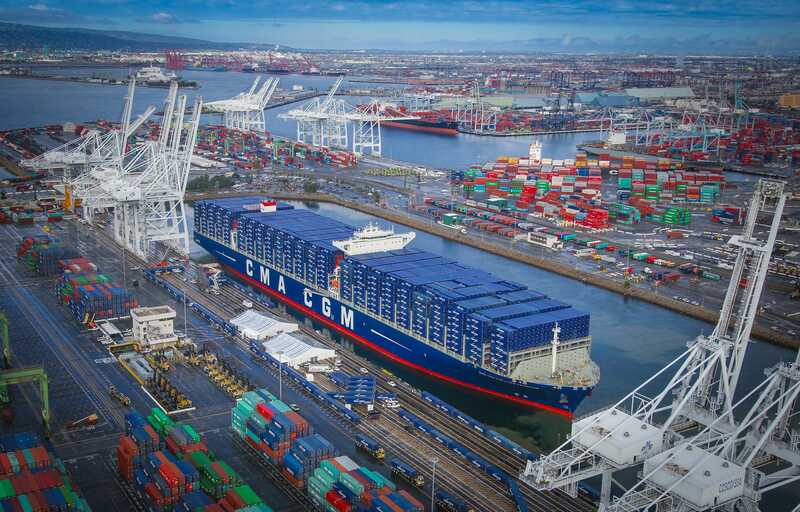 Just last year, behemoth container ships like the CMA CGM Benjamin Franklin, which can carry 18,000 20-foot containers, began serving West Coast ports. Ships able to pass through the new canal will be limited to a capacity of 13,000 containers. And in the short term, many East Coast ports cannot yet accommodate even that limit. Savannah, Georgia, already one of the busiest ports in the US, began a $706 million project to dredge its main waterway by 5 feet, but the project will not be concluded until 2021, the Associated Press reported. In the meantime, thousands upon thousands of square feet of warehousing space is being built further inland in preparation for a big uptick in cargo volume. In New York, container ships are limited by the height of the Bayonne Bridge, which straddles the port’s entrance. A project to raise its roadway will finish in 2019, according to the Port Authority. 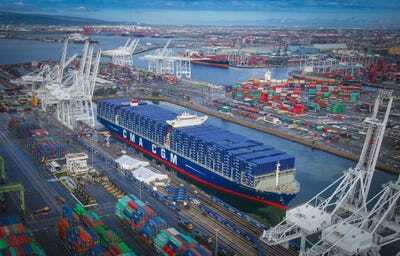 CMA CGMThe CMA CGM Benjamin Franklin. Longer than an American aircraft carrier, it set a record for the largest ship to dock at the port of Long Beach in California. “The other thing that many folks don’t incorporate into any analysis of this is the boxes,” Vernon said. A shift in the amount of cargo taking a one-to-two-week-longer trip though the Panama Canal and to the East Coast would mean that much more cargo is at sea at any given time, requiring cash-strapped shipping companies to buy more shipping containers to maintain the flow of goods — an investment they are unlikely to want to make, Vernon said. In terms of exports, railroads west of the Mississippi River may even benefit from the expanded canal, as Business Insider reported in 2014. Agricultural goods from the American heartland, as well as oil and natural gas from a booming industry in the upper Midwest, will have a dramatically shorter trip from the Gulf Coast to ports in eastern Asia, and it could increase demand for railroads that move cargo from the Midwest south and toward the Gulf. The ultimate impact of the canal on other industries depends on many unpredictable elements — even the weather. The canal’s capacity is currently constricted by the water levels in Lake Gatun, which are low because of El Niño. “There are a lot of moving parts,” Butler, the Union Pacific executive, said. Add all of this together, and it may be years before the canal once again causes an upheaval in international commerce. “The change will be an evolution rather than a revolution,” Poskus said.